I have been looking for many years to replase my wedding ring that just wore out after 30+ years so for the last 10 I''ve been looking. My wife bought the ring for me for our wedding anniversery (42 Yrs). I just love it, it''s unique and nice looking. I have had many complements. In the description of the ring it says- &quot;classic dragon''s head inside&quot;. I can find no dragon''s head anywhere on the ring. Other than that it looks very classy and fits perfect. Very comfortable. I got it to symbolize a four year relationship with my special lady and it suits the purpose very nicely!I am Scottish and the Celtic designs have a lot of meaning for me. Well worth the price! I bought this ring several months ago for my husband. He is not one to wear jewelry but he has not removed it since I gave it to him. I was very pleased with the ring.The only negative about this ring is that it does not come in half sizes.I will be shopping with Staur for years to come. Beautiful and solid ring. Much more impressive in person then the picture can show.. great detail. My fiance had picked it out independently from me. I had found it, and showed her, however she had already purchased it. 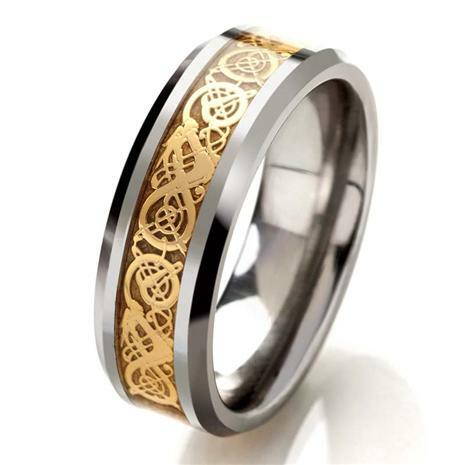 I''m going to have the most unique wedding band ! Love it !! Very impressive! I did see the dragon heads, have counted eight. Very solid and handsome. My girlfriend really likes it. Well worth the price. This is the first ring I have bought I really love. I have always been fascinated by Dragons, real or mythical, which makes wearing this beautiful ring all the more enjoyable. My wife likes it too. This is my wedding ring. I have worn it for 6 years and I have not gone easy on it, but it withstands anything it seems. It is very durable and shows no wear whatsoever. A dense mist hangs over the Moors. Your sword is heavy at your side. Suddenly, up ahead, you hear what sounds like a low growl. You grab the hilt of your weapon and move toward the sound. Capturing a dragon seemed a lot less frightening when it was being discussed in the halls of the castle. But now the sense of an approaching monster is all too real. You take another step and draw your sword. Dragon hunting in the Middle Ages was an intense endeavor that included cold sharp steel and hikes into dark forests. But today, we've made it easier than ever to land an impressive dragon trophy. And the metal involved is a lot more impressive. 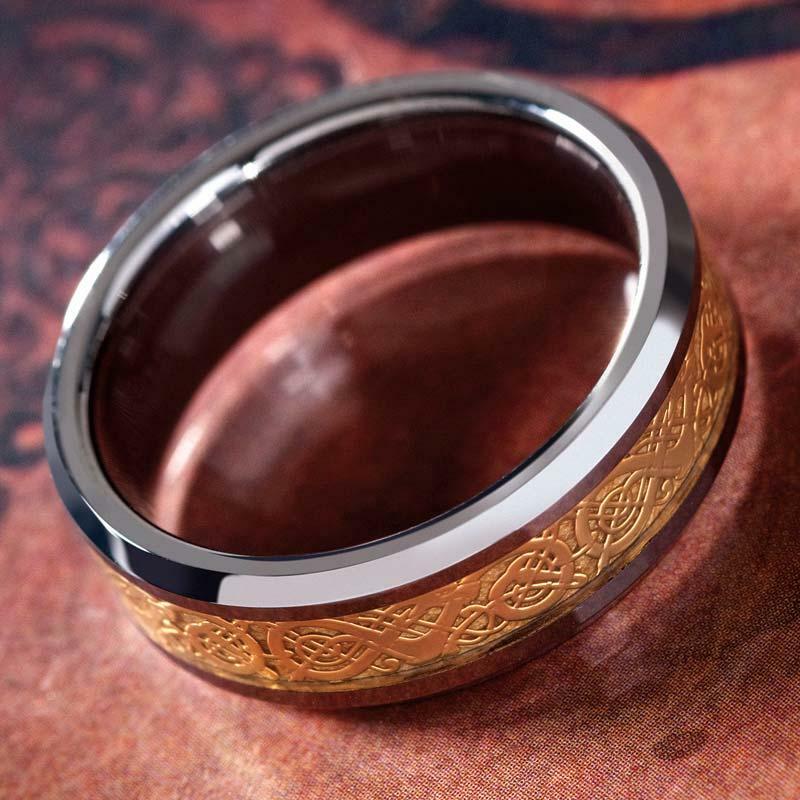 Our Draco Men's Ring is crafted from tungsten, one of the most amazing materials on earth. It's 71% denser than lead, four times harder than titanium, and used in rocket nozzles and armor-piercing bullets. Tungsten seemed the perfect metal to use to catch an immense imaginary creature (if you consider them imaginary). 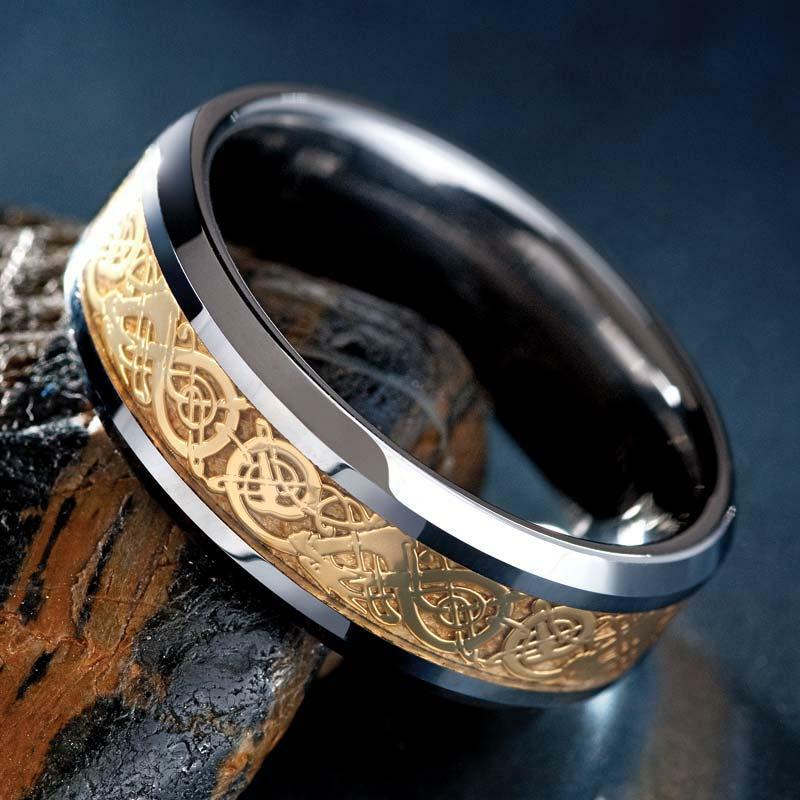 A striking Celtic-influenced pattern full of dynamic swirling detail runs along the full length of the band. Inside, the classic dragon's head design almost seems to burn with fire. But have no fear. You can claim your trophy. The hunt is over.